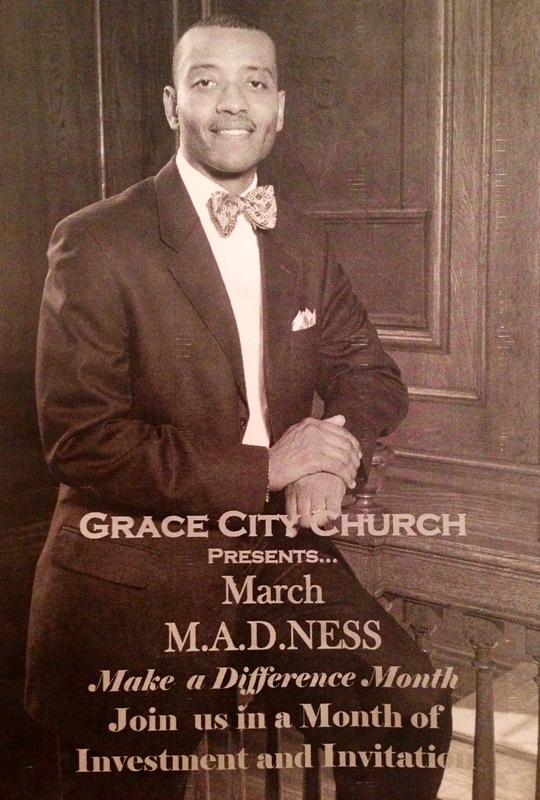 Grace City Presents March M.A.D.NESS (Make A Difference Month). Join us in a Month of Investment and Invitation. March 2: Launch of Gifts of Grace: Beauty Supplies for Women in Domestic Abuse Shelters and Diaper Drive for Women’s Choice Center. March 13: Grace In The City: Join us as we provide food and service for Rock Island Township. March 15: Sisterhood of Grace: Women’s Potluck Social come out and enjoy food and fellowship with the Sisters of Grace City. March 23: Old School vs. New School BasketBall Game: Special Guest YouthHope. March 30: College Student Fellowship: Join Grace City as we invite college students and young adults to a free home cooked meal. This entry was posted in Church, Grace City Church and tagged community, difference, fellowship, God, Grace City Church, love, March, service. Bookmark the permalink. ← Celebrate Black History Month!